Changing seasons signal trouble for many Americans who suffer from allergies, and this fall might be worse than most years. According to the Asthma and Allergy Foundation of America (AAFA), about 40 million Americans suffer from seasonal allergies. The foundation warns this year's situation is not going to get better, especially with climate change affecting pollen levels and redistributing allergens. Part of what may make this fall especially bad for allergy sufferers is that rising temperatures and carbon monoxide levels may make ragweed season linger for an additional month or more. "The East Coast has had a much more severe problem with ragweed this year than probably the last decade," Dr. Michael A. Kaliner, founder of the Institute for Asthma and Allergy in Chevy Chase, Md., told CBSNews.com. Pollen from weeds may also present a big problem come the fall, and urban locations especially may have more weeds than they do spring gardens. An above-average hurricane season had been predicted on the East Coast for this fall -- so far it's been slow -- and many tornadoes are expected in the Midwest. Such weather events could increase pollen distribution. Additional wet weather could add to abundant levels of outdoor mold that persist because of 2012's major storms like superstorm Sandy. Each year, the AAFA predicts which U.S. residents are most at risk for allergy problems in its 2013 Fall Allergy Capitals Report, which was released on Tuesday. Cities on top of the list are considered the worst places to be in if you have seasonal allergies. One hundred cities are scored according to their pollen levels, how many of their residents use allergy medication and how many board-certified allergists there are per patient in the area. Pollen scores consist of the number of recorded pollen/mold spores in a given area and predicted prevalence for particular types of pollens or mold based on the most recent fall season. 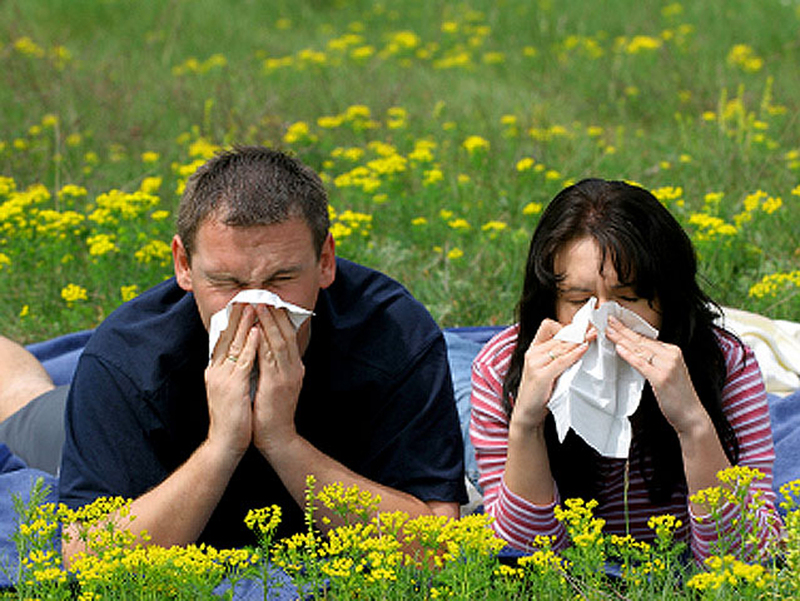 The number of city residents who are allergic to pollen is also taken into account. Wichita, Kan. is this year's number one allergy capital of the U.S., moving up one spot from last year's second place ranking. Rounding out the top five are Jackson, Miss. ; Knoxville, Tenn.; Louisville, Ken. (2012's number one) and Memphis, Tenn. The AAFA warned that many people often confuse their allergies with cold or flu, which could lead to misdiagnosis and delayed treatment. "AAFA encourages the approximately 40 million Americans who suffer from seasonal allergies to learn more and consult an allergy specialist for proper diagnosis and treatment of seasonal allergy symptoms," Mike Tringale, vice-president of external affairs at AAFA, said in a press release. Kaliner, who is a spokesperson for the AAFA, added that there is no way to cure your allergies for food. They are something that affect 25 percent of the population, and allergens are growing in prevalence every day. However, you can make your allergies less intense. "There are lots of things you can do, but the real issue is how effective they are," Kaliner said. While moving out of your city is probably unlikely, he suggested something as simple as dust avoidance, if you are especially allergic to dust mites this time of year from spending more time indoors, can help. This includes covering pillows and mattresses with plastics or other hypoallergenic covers, lowering the amount of dust mites in your home by washing your bedding in pillows in warm water and detergent and drying them on a hot setting, and removing carpets when not necessary. If you have a child with allergies, limit the number of stuffed toys they have and wash the toys regularly. Controlling the humidity can also work wonders. Medication can help in some cases, but the Food and Drug Administration (FDA) warns consumers to read the label and make sure they know the side effects. Many antihistamines may make people too drowsy to drive, and not all medications have the same dosage. For people who have dog or cat allergies, the answer might be as simple as not getting a furry, four-legged pet. But, if you insist your life isn't complete without a canine or feline, Kaliner said getting an allergy shot may be able to help. "If allergies are diagnosed properly with a skin test, then allergy shots can work great," he pointed out.